QSI 660wsg monochrome camera adds, in respect to the 660i, mechanical shutter, integrated 5x31,8mm filter wheel and off axis guider. The QSI 660wsg model camera employs a 6.1mp Sony CCD image sensor with peak QE of over 75%. The high sensitivity, wide dynamic range, dual read rates and low noise performance make the QSI 660wsg ideally suited to a broad range of demanding scientific, medical, astronomical, and industrial imaging applications. The QSI 600 Series offers dual read rates of up to 8 MHz with high-speed USB 2.0 and full 16-bit output that allow 600 Series cameras to produce high quality images with high frame rates, extremely wide dynamic range, excellent linearity and exceptionally low noise. The QSI 600 Series has many different models and a variety of options and accessories are available to meet your specific medical, astronomical or industrial imaging objectives. The superb imaging performance of 600 Series cameras is wrapped in an attractive, compact design with outstanding power efficiency and investment protecting upgradeability. The refined engineering and impressive fit, finish and attention to detail will surpass your highest expectations. The WSG has an internal mechanical shutter and filter wheel like the "ws" models, plus it adds an Integrated Guider Port. This allows guiding using the light from your main telescope while picking off the light from the guide star in front of the filters. Guiding with a separate guide scope provides the most flexibility, but differential flexure can be an issue, especially with long focal length scopes. With an internal guide chip, you're forced to guide with light through your filters and you can't guide at all while the shutter is closed or an image is being downloaded. This is especially problematic for narrowband imagers. To get around those issues, you could add an external off-axis guider, but a traditional OAG can add an inch or more of back focus plus more weight and two new mounting surfaces that need to be held rigidly. 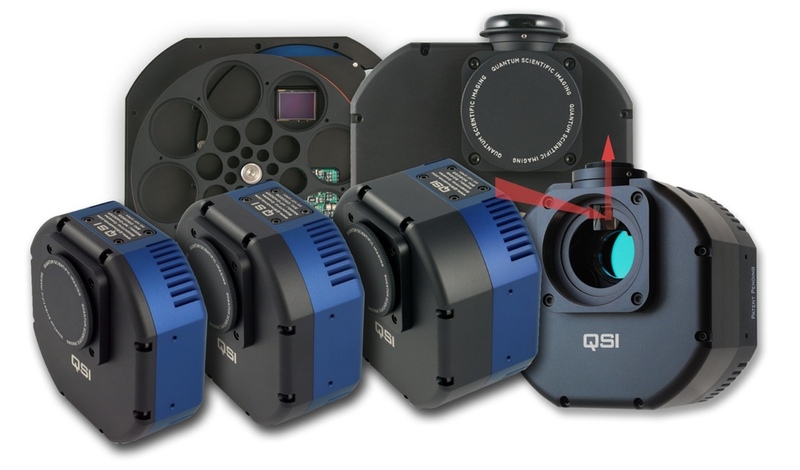 The QSI 600 Series WSG models solve the problems with other guiding solutions by integrating a precision off-axis guider directly into the camera body with the pick-off prism positioned in front of the integrated color filter wheel – right where it belongs. The Integrated Guider Port (IGP) built into 600 Series WSG models is designed to support any camera with 12.5mm of back focus or less that can be attached using C-mount or T-mount threads. The guide camera attaches to the WSG using a C-mount or T-mount threaded adapter (specified at time of order). The threaded adapter sits on top of the focus ring and allows the guide camera to be rotated to any position. The focus ring threads onto the focus base to allow 3mm of travel when focusing the guide camera. Once focus is achieved, the focus ring is locked with a set screw. The guide camera can still be rotated manually if desired without changing the focus. 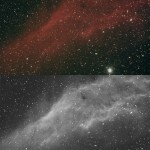 The end result is a rigid, easily focused guide camera that will not move or flex while your mount tracks the apparent motion of the night sky. The 2758x2208 sensor in the QSI 660, shown to the left approximately life size, provides extremely high resolution with its 4.54µm pixel. The QSI 660 camera employs a Sony ICX694 6.1 megapixel interline transfer CCD image sensor with microlens technology. The Sony ExView sensor has exceptional sensitivity across the visual band with peak quantum efficiency of 77% along with remarkably low dark current. The sensor has antiblooming protection and a fast electronic shutter. Micro lenses cover the surface of the CCD to focus the light into each 4.54µm pixel to increase optical response. Two separate analog processing chains, providing dual read rates, allow the QSI 600 Series to meet two seemingly incompatible imaging goals. The QSI 600 Series High Quality mode provides the highest possible Signal to Noise Ratio (SNR) for applications that require the lowest noise and widest possible dynamic range. High Speed mode has a read rate of 8MHz providing high speed reads at multiple frames per second. The read mode is easily changed under program control providing exceptional flexibility it tuning the camera's performance to the desired imaging goals. Small enough to practically hide behind a CD-ROM, the medium format QSI 600 Series family sets new standards for full-featured, high performance scientific CCD cameras. The striking appearance, refined design and superior fit and finish only hint at the advanced technical performance lurking inside. Some have described it as a work of art. Key in the compact design of the 600 Series cameras is a very efficient custom 2-stage thermoelectric cooler (TEC) subsystem. Intelligent, programmable cooling fans are integrated into the rear of the camera body to remove the heat generated by the cooler. 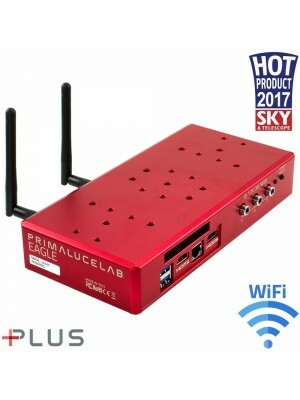 Typically, forced air cooling lowers the regulated CCD temperature by up to 45°C below ambient utilizing 85% power. Tight +/- 0.1°C temperature regulation is maintained at temperature settings of 10°C below ambient and lower. A slim liquid heat exchanger can be attached to the rear of the camera body to increase the cooling further, up to 55°C below the temperature of the circulating fluid.